Immunosuppressants or immune suppressants are usually used in conjunction with corticosteroids to block inflammatory reaction and decrease initial damage to cells in cases of organ transplantation and autoimmune diseases. 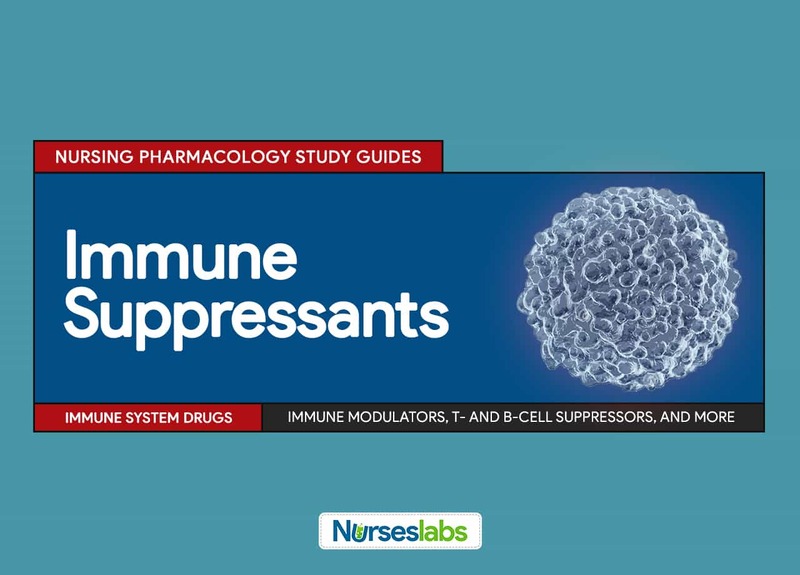 Immunosuppressants include immunomodulators, T- and B-cell suppressors, interleukin receptor antagonist, and monoclonal antibodies (antibodies produced by a single clone of B-cells that react with specific antigens). Immune modulators block chemicals to suppress the immune system. Blocking the release of various cytokines involved in the inflammatory response and activation of lymphocytes, decreasing immune activity. Lenalidomide and thalidomide inhibit proinflammatory cytokine secretions and increase anti-inflammatory cytokines from monocytes. Thalidomide is used in the treatment of multiple myeloma and erythema nodosum leprosum. Fingolimod inhibits the release of lymphocytes from lymph nodes into the peripheral blood so they cannot migrate to activate immune and inflammatory reactions. It is the first oral agent for the treatment of relapsing forms of multiple sclerosis. Pregnancy. Can cause serious fetal harm. These drugs inhibit the actions of the cell-mediated immunity. Not clearly understood. However, it has been shown that they block antibody production by B cells, inhibit suppressor and helper T cells, and modify the release of interleukins and of T-cell growth factor. Prevention and treatment of specific transplant rejection. Known allergy to drug and its components. Prevent hypersensitivity reactions. Pregnancy and lactation. Potential serious adverse effects on the fetus or neonate. Renal or hepatic impairment. Interfere with metabolism or excretion of the drug. Known neoplasms. Potentially could spread with immune system suppression. Increased risk for infection and development of neoplasms. Other hepatotoxic and nephrotoxic drugs. Combined toxicity. Interleukin receptor antagonists block the activity of the interleukins that are released in an inflammatory or immune response. The only available interleukin receptor antagonist is anakinra (Kineret). Antagonizing human interleukin-1 receptors, blocking the activity of interleukin-1. Interleukin-1 levels are elevated in response to inflammatory or immune reactions and are thought responsible for the degradation of cartilage that occurs in rheumatoid arthritis. Reduction of signs and symptoms of moderately to severely active rheumatoid arthritis in patients 18 years of age and older who have not responded to traditional treatment. Known allergy to E-coli-produced products and to the drug itself. Prevent hypersensitivity reactions. Pregnancy and lactation. Drug may cross placenta and enter breast milk. Renal impairment, immunosuppression, active infection. Exacerbated by the effects of the drug. Etarnecept (Enbrel). Potential for severe and life-threatening infections. Monoclonal antibodies attach to specific receptor sites to exhibit their immune suppressor actions. Reacting as an antibody to human T cells, disabling T cells and acting as an immune suppressor. Muromonab-CD3 is the first monoclonal antibody approved for use. It is indicated for treatment of acute allograft rejection in those receiving heart or liver transplants. Known allergy to drugs and to murine products. Prevent hypersensitivity reactions. Fluid overload. Can be exacerbated by drugs. Pregnancy and lactation. Potential adverse effects to fetus or neonate. Previous administration of monoclonal antibody. Serious hypersensitivity reactions can occur with repeat administration. Respiratory: acute pulmonary edema associated with severe fluid retention and cytokine release syndrome (flu-like symptoms that can progress to third-spacing of fluids and shock). Eculizumab can lead to intravascular hemolysis with resultant fatigue, pain, dark urine, shortness of breath, and blood clots. Assess for contraindications or cautions (e.g., history of allergies, pregnancy or lactation, renal and hepatic impairment, history of neoplasms, etc.) to avoid adverse effects. Assess for presence of skin lesions to detect early dermatological effects. Obtain weight to monitor for fluid retention. Monitor temperature to detect any infection. Evaluate CNS status to assess CNS effects of the drug. Monitor pulse, blood pressure, and perfusion to assess for bleeding effects or cardiovascular effects of the drug. Monitor laboratory tests for CBC and liver and renal functions tests to determine the need for possible dose adjustment and to identify changes in bone marrow function. Arrange for laboratory tests before and periodically during therapy, including CBC and differential, to monitor for drug effects and adverse effects. Administer drug as indicated; instruct patient and significant other if injections are required to ensure that the drug will be given if the patient is not able to administer it. Protect the patient from exposure to infections and maintain strict aseptic technique for any invasive procedures to prevent infections during immunosuppression. Arrange for supportive care and comfort measures (e.g., rest, environmental control) to decrease patient discomfort and increase therapeutic compliance. Provide patient education about drug effects and warning signs to increase knowledge about drug therapy and to increase compliance with drug. Monitor for adverse effects (e.g., flu-like symptoms, GI upset, increased infections, neoplasms). Blocking the activation of lymphocytes. Increasing the release of various cytokines involved in the inflammatory response. Immune modulators block the release of cytokines. This is the first oral agent for the treatment of relapsing forms of multiple sclerosis. The only available interleukin receptor antagonist. This drug(s) disable(s) T cells to act as an immune suppressor. This drug reacts as an antibody to human T cells thereby disabling them. It is the first monoclonal antibody for use. It is indicated for treatment of acute allograft rejection in those receiving heart or liver transplants. B. Blocking the activation of lymphocytes. C. Increasing the release of various cytokines involved in the inflammatory response. 1. Answer: C. Increasing the release of various cytokines involved in the inflammatory response. 2. This is the first oral agent for the treatment of relapsing forms of multiple sclerosis. 3. The only available interleukin receptor antagonist. 4. This drug(s) disable(s) T cells to act as an immune suppressor. 5. It is the first monoclonal antibody for use.